Change your forecast category names to match the ones your team uses. 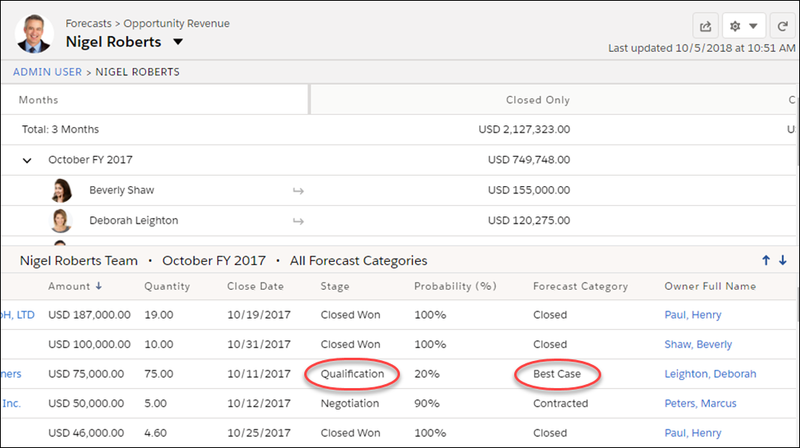 A forecast category is the category within the sales cycle that an opportunity is assigned to based on its opportunity stage. We give you these standard categories. But you can change their names. If you change a forecast category’s name, the new name appears on opportunity records and on the forecasts page if you chose individual forecast category rollups. If you chose cumulative forecast rollups, the new category name appears in the opportunity list but not in its header. Nigel asks Lauren to provide category names that make more sense for Rollings Tech. Remember in the previous module that she enabled Collaborative Forecasts. Lauren now follows these steps to change the name of the Commit category to Contracted. From the Object Manager in Setup, select Opportunity, then Fields & Relationships. Click Edit next to the value that you want to edit in the Forecast Category Picklist Values. Enter a different category name in the Label field, then click Save. Lauren only changed the label that her forecast users see. She didn’t change the API name, so it’s still Commit. Keep in mind that forecast categories map to opportunity stage values. An opportunity stage value is the current stage of an opportunity, such as Prospect or Proposal. Opportunity stage values correlate with forecast category values to determine how the opportunity contributes to a forecast amount. Salesforce includes default correlations, but you can customize them. For example, Nigel asks Lauren to map the Qualification stage to the Best Case forecast category. Here’s what Lauren does. From the Object Manager in Setup, click Opportunity, then click Fields & Relationships, then Stage. Scroll down to Opportunity Stages Picklist Values to see each stage name and what forecast category it’s mapped to. Next to the Stage Name you want to map to a forecast category, click Edit. From the Forecast Category picklist, select the category that you want mapped to that stage, then click Save. You can also change the opportunity stage picklist values. For example, you can change Qualification to In Progress. We include a link to instructions for customizing the picklist values in the Resources. Lauren has been pretty busy, and she’s already accomplished a lot. But there’s still more to do. She needs to enable her team to adjust forecast amounts. Forecast users make adjustments to show the final amount that they expect a forecast’s opportunities to bring in at the close of a given period. Sometimes forecast managers need to adjust a team member’s or territory’s forecast. For example, some employees can be too optimistic or too conservative when assigning amounts to opportunities. Forecast users can also adjust their own forecast amounts, including territory forecasts they own. An adjustment doesn’t change the underlying gross rollup amount. It just adds a layer of detail. 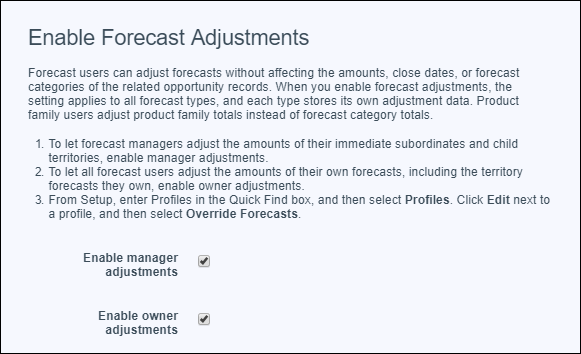 If you enable multiple types of forecasts, each type maintains separate adjustments. 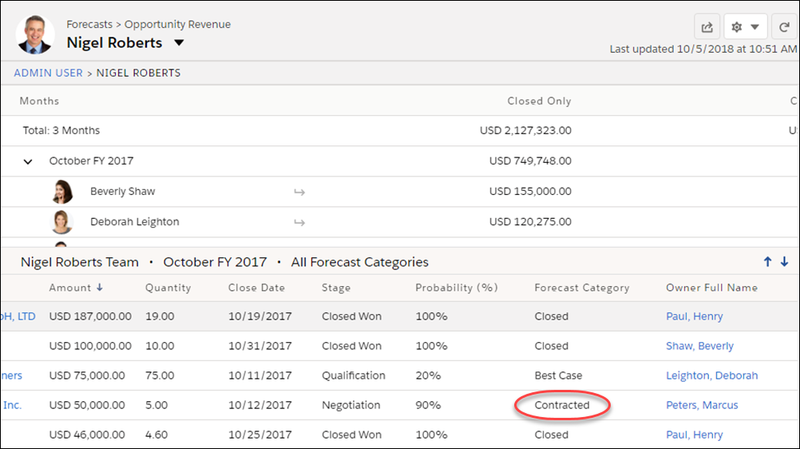 For example, if you adjust an amount in the opportunity-revenue forecast, you won’t see an equivalent adjustment value in the opportunity-quantity forecast view. Lauren needs to enable both types of adjustments. In your Trailhead Playground, they might already be enabled. On the Forecasts Settings page, under Enable Forecast Adjustments, select Enable manager adjustments. Select Enable owner adjustments, and click Save. Lauren has now configured Collaborative Forecasts so that it shows the forecast category names her team uses when they do business. She also has enabled her team to change forecast amounts that don’t accurately reflect what’s going on with the pipeline. Next up: currency and quotas!